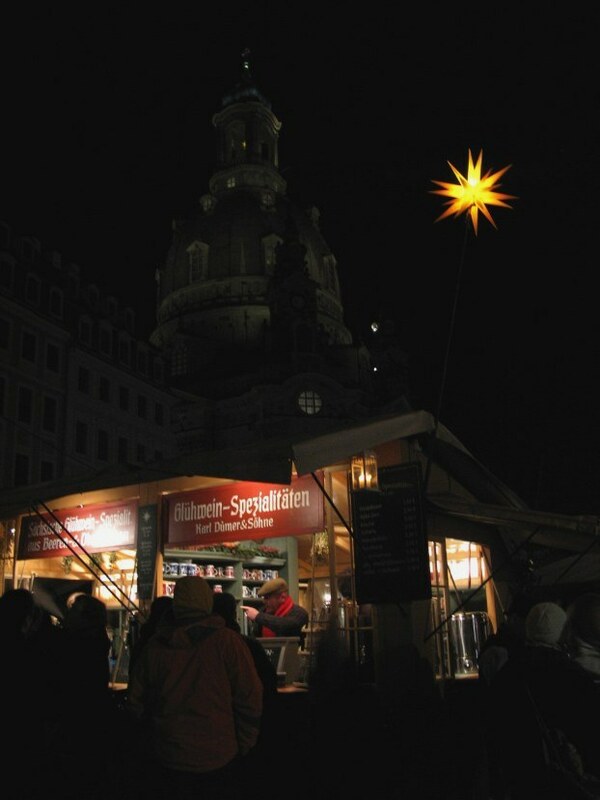 One of the biggest free events of northern Germany, the opening of the Dresden Christmas Markets on the first Wednesday of Advent starts with a service in the Dresden Kreutzkirche or Church of the Holy Cross, whose records date from 1168. 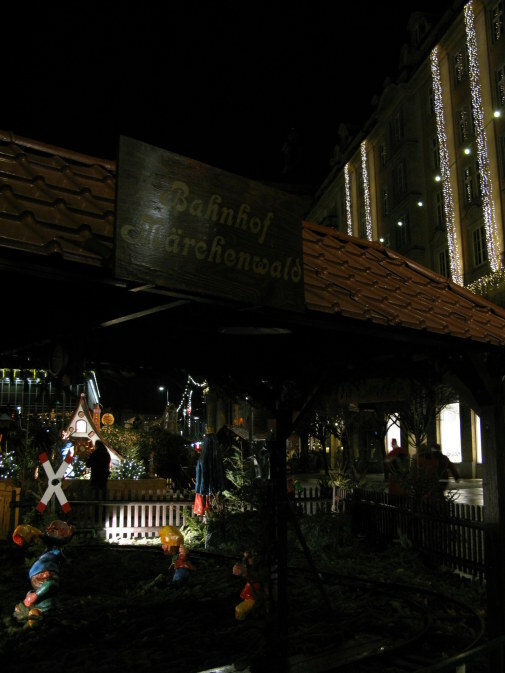 The event is attended by over 3000 people and celebrated by the miner’s orchestras and carollers until, from the official performance stage the Mayor of Dresden pronounces the Weichnachtsmarkts or Christmas Markets officially open and the magical lights lit. 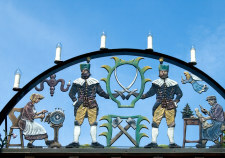 The entrance to the Striezelmarkt is announced by a traditional German Candle Arch or Schwibbogen), named for a Gothic architectural feature, the floating arch. The decorative form in its first incarnation was made in the city of Johanneorgenstadt in the Erzebirge region of Saxony, which sits on the border of what is now the Czech Republic. It is one of the snowiest regions in Germany, earning a common description as being the Saxon Siberia, with a Russified adapted nickname of Johannsibirsk. The Erzebirge (Ertz means Ore) is still known as the Ore Mountains. Here, the still lit lanterns of the miners were hung around the pit in a semi-circle of light after the last shift before Christmas, so inspiring the creation of what is now a tradition: the Candle Arch or Schwibbogen. The Klöpplerin or Bobbin Lace maker. The handiwork of the lace makers of the region was sought after worldwide before automation impacted their markets. Bergmann or miner. From the early 1300s and onwards sculptures of miners feature in churches across Germany, showing their importance to the economy. Wunderblume or Magic Flower, the harbinger of spring and brighter days. Today their wooden successors often still include traditional features but also can feature many more. 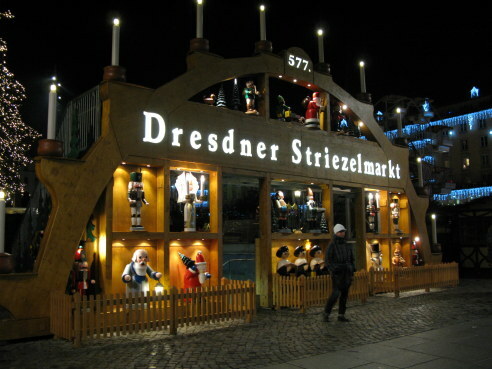 At the Strietzelmarkt in Dresden the candle arch features other great exports of the Ore Mountains: hand-carved wooden figurine candleholders, nutcrackers, and smoking figures. 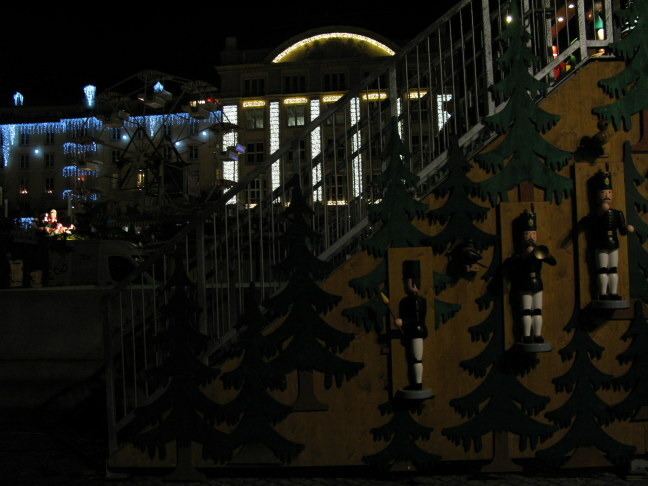 The familiar wood-carved toy soldier from the Nutcracker escorts you up Dresden stairways even after the lights of the Ferris Wheel have gone out for the night. 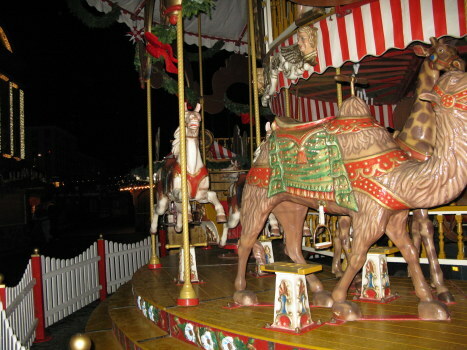 Certainly the forms of transport on the Dresden Striezelmarkt carousel represented that of the Christmas story, including both horses and camels – but how did the giraffe get there? 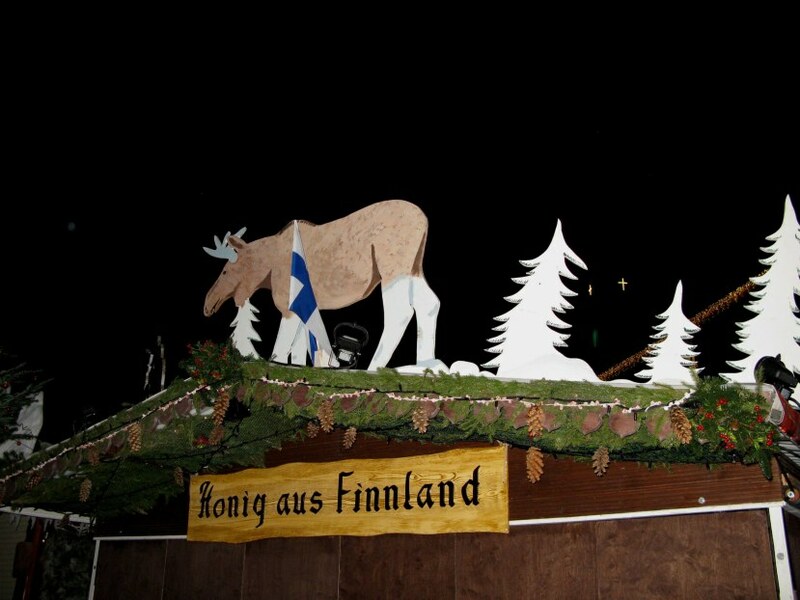 The king of Finland’s reindeer was keeping watch above one of the stalls. 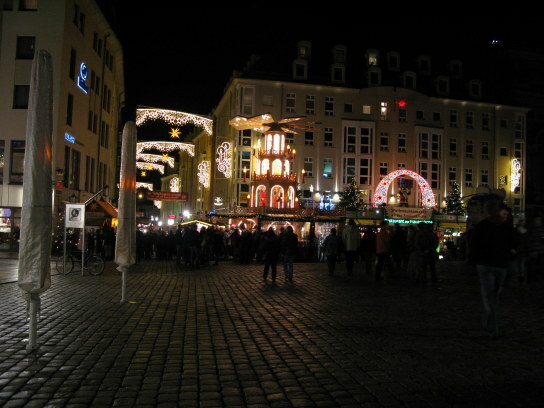 I had driven almost five hours after work so I could experience at that late hour what I could of the Dresden Christmas market. 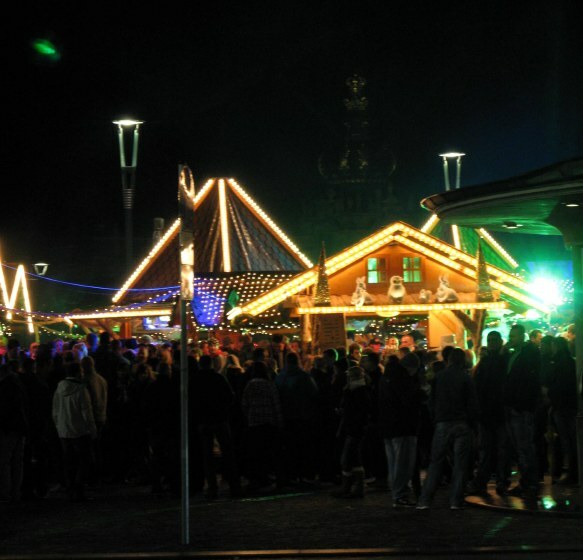 By the time I arrived the last stalls were closing down, with friends gathered for a last warming of Glühwein as each food stall cleaned up after another long day of delighting visitors. 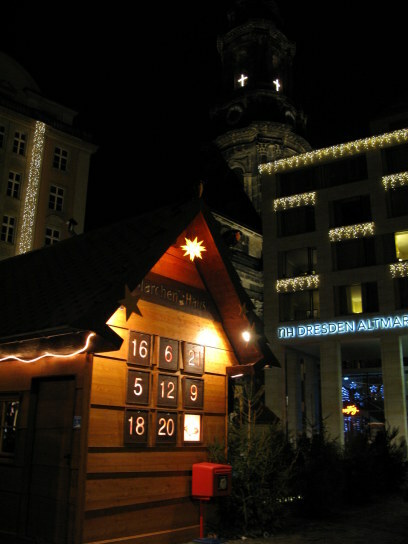 The famous Advent Calendar and puppet theatre had long since closed for the night since little people would now be in bed dreaming of the Weichnactsmann arriving on the 24th of December with his sack of presents. 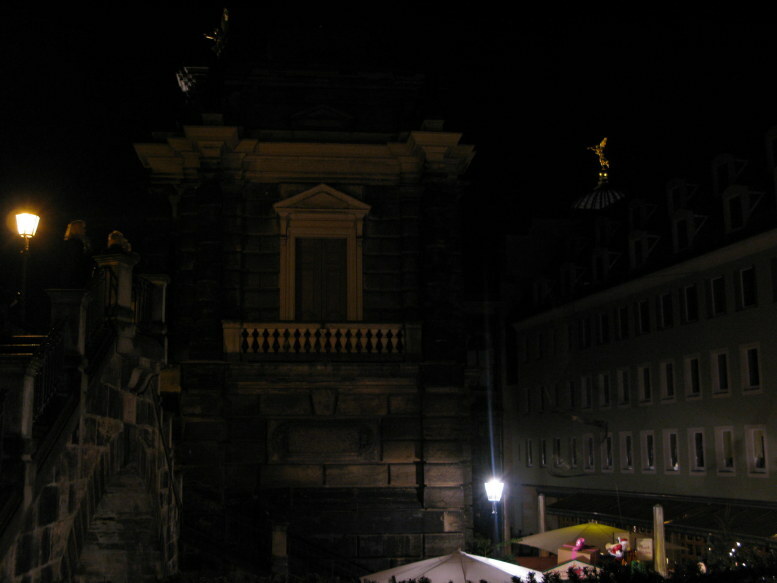 The Fairy House and its little kiosk and garden sit just under the imposing spire of the Kreutzkirsche, the Church of the Holy Cross. 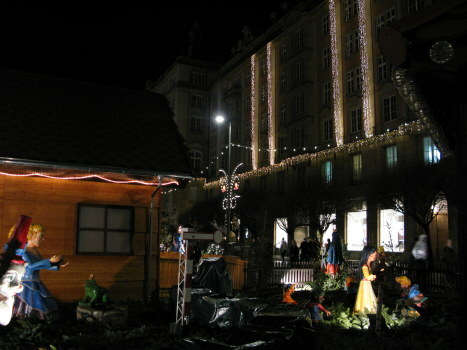 Here the toy train had been put to bed but the fairy story figures were still illuminated. There was the princess who kissed the frog, and another set of miners besides those from the Ore Mountains of Saxony who gave German Christmas markets so many traditions: the seven dwarfs who here surrounded Snow White. 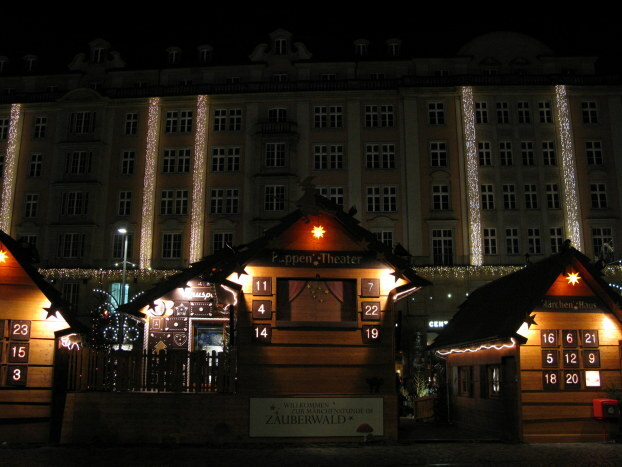 The fairy tale characters of the Dresden Christmas Markets have their own little Railway Station at a stop called “The Fairy Wood”. 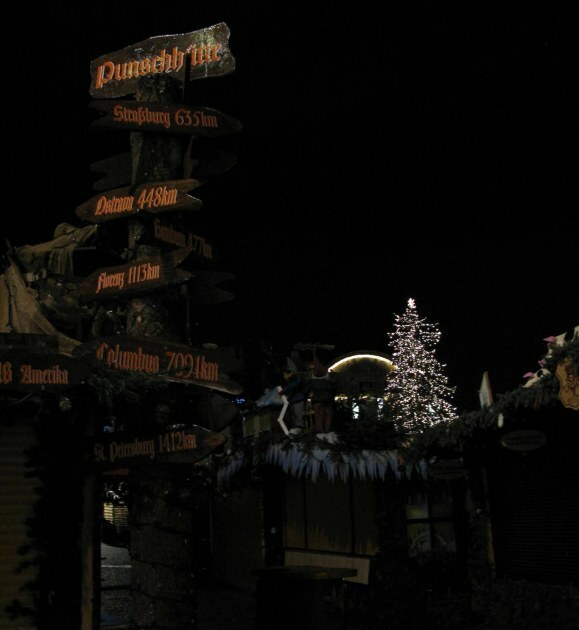 Guiding Santa, the milepost showed the Dresden Christmas Market to be 635km (394 miles) from Strasbourg, 1113km (991 miles) from Florence, 1412km (877 miles) from St. Petersburg – and it seemed unaccountably why here listed – 7091km (4406 miles) from Columbus, Ohio – although according to Maps the distance is 4,544 miles, so I guess it depends on what route your sleigh takes! In fact this caused me to discover that Columbus, Ohio and Dresden are partner cities, and it is in Columbus’s world renowned German Village that German heritage kept alive. The things you learn at a Christmas Market! 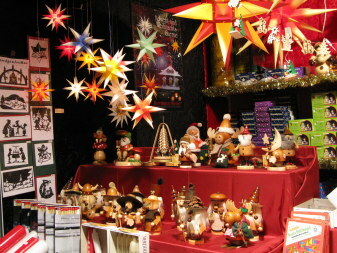 The Dresden Christmas Markets almost flow one into another, in 2017 there are eleven, big and small, each with a particular personality. This is where locals annually meet and exchange good wishes, tall tales and true, and general conviviality. 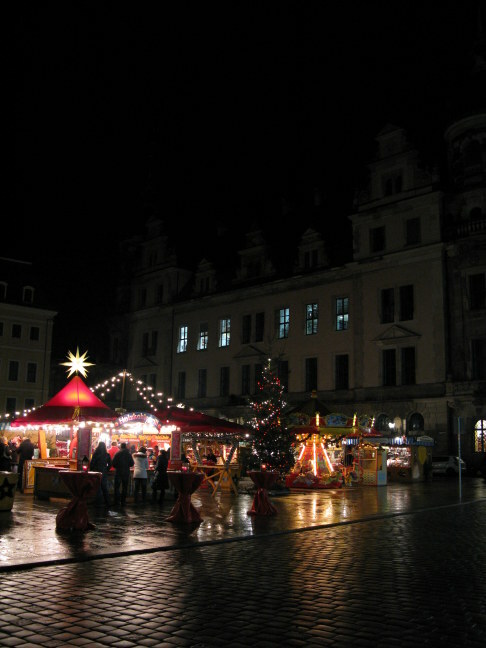 This one on the Postplatz seems popular with students. 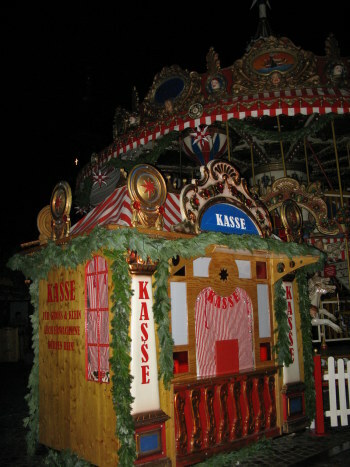 Further along as I headed towards the Advent Market and the traditional Christmas Market around the beautifully restored Frauenkirche, I discovered another carousel – in miniature for very little people. I passed the Weihnachtspyramide or Stufenpyramide, the Dresden Christmas step pyramid, similar to those that grace all the Christmas Markets I have visited in Germany – again, each city's pyramid having its own personality. These traditional wooden pyramids are really shaped around layers of four or eight sided wooden platforms, making a sort of multi-layered carousel. The figurines that stand on each layer are traditionally also carved from wood. 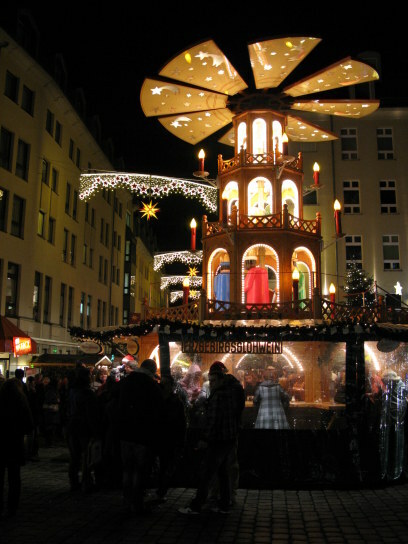 In a smaller form, the Christmas Pyramid uses candle-heat to a fan at the top which turns the platforms, often tingling tiny chimes as they do. 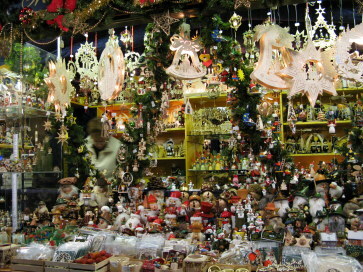 Many of us have smaller imitations of the same in our own Christmas collection. 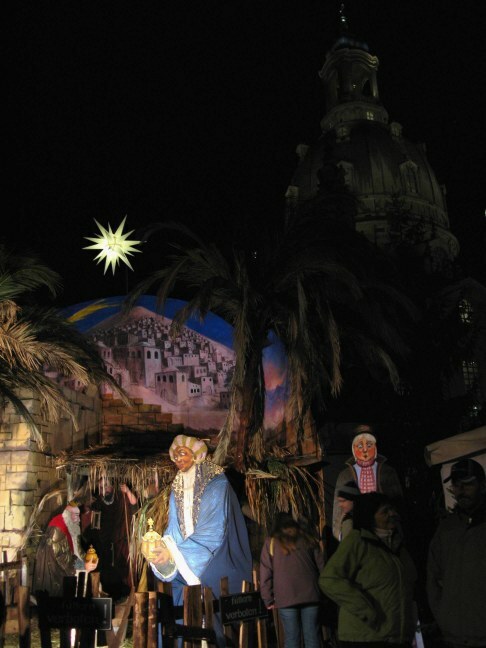 The origin of the rotating Christmas pyramid comes from an adaptation of a tradition of the middle ages tradition at the mine face, when a light stand of green boughs lashed to four centrally secured poles was lit by candles. 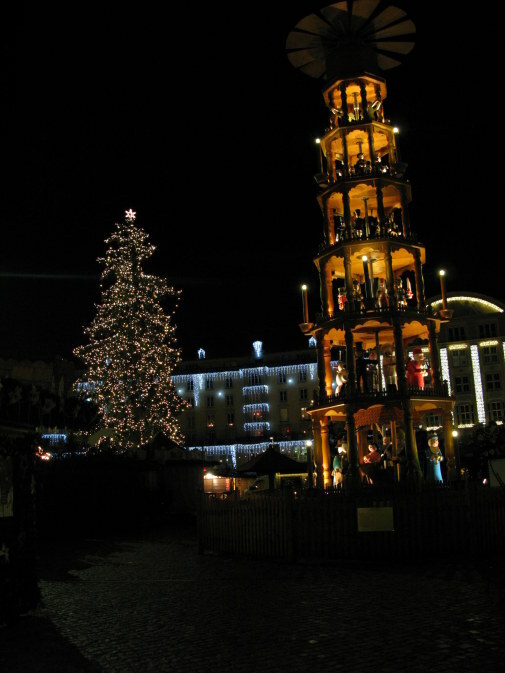 It is said that our modern day Christmas Pyramid also originates from the Ore Mountains where the originals imitated the spinning capstans from the mines, even to the spinning circle above – that in the Christmas Pyramid is a fan drawing the candle flames upwards. In Dresden the Christmas Pyramid has a wonderful nativity scene, with kings and shepherds, sheep, and cattle carefully carved and painted. 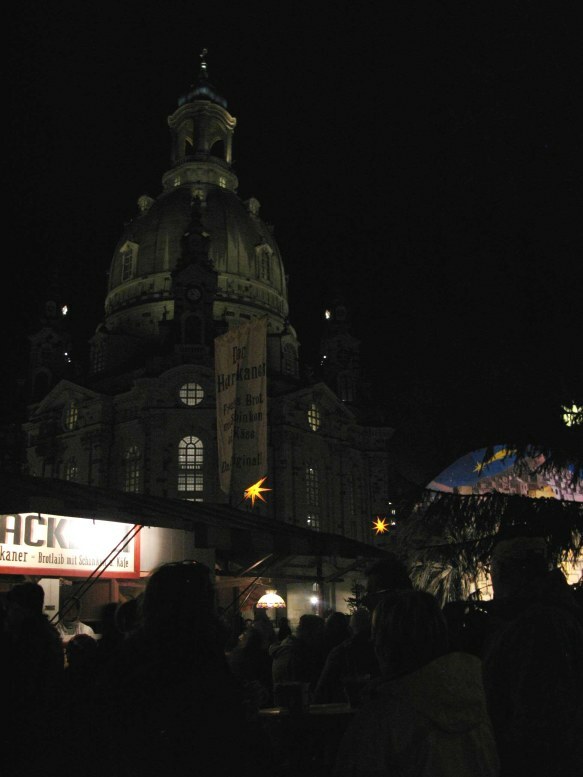 The Christmas market around the Dresden Frauenkirche has a long tradition. 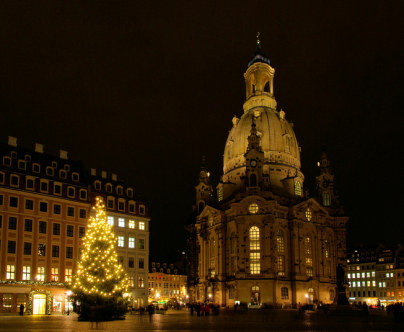 The Dresden Frauenkirche – the famous church of Our Lady – was destroyed in World War II in the Allied bombing of Dresden following the destruction of Coventry and its cathedral. A tribute to the fact that wars are made by governments and not people is the global support of finances to rebuild this beautiful church – and the fact that Coventry took the lead in working with Dresden to do so: a sort of year round ‘spirit of Christmas’. 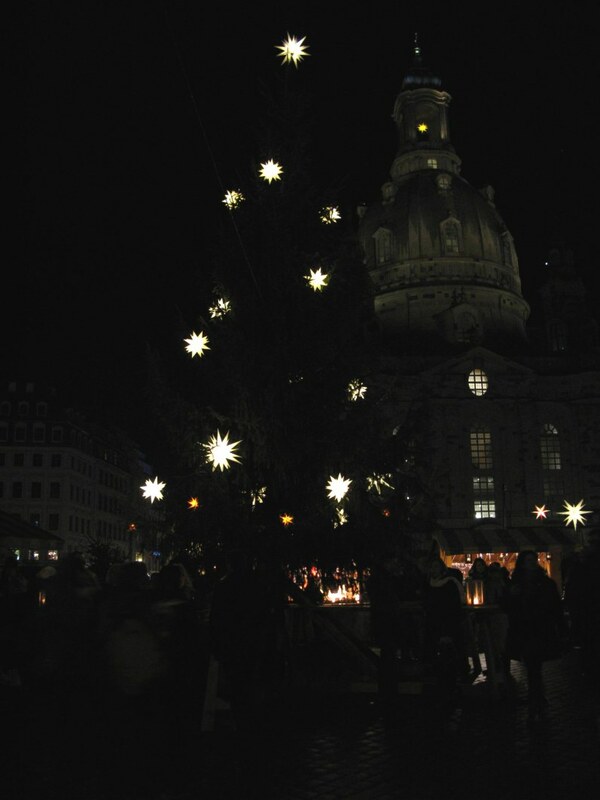 This photo taken by LeonM captures the way that the Frauenkirche draws you to it at Christmas – but it does so even out of the festive season. 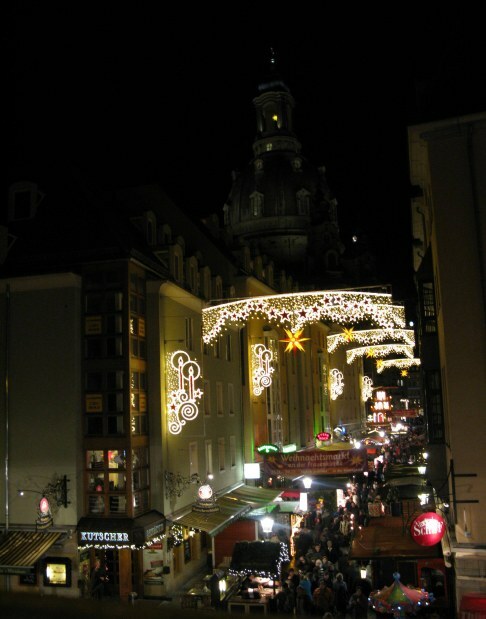 My own photo, taken from the other side of the Frauenkirche, was not so well lit but certainly still shows its magic as a backdrop to this, one of the oldest and loveliest Christmas markets in Germany. 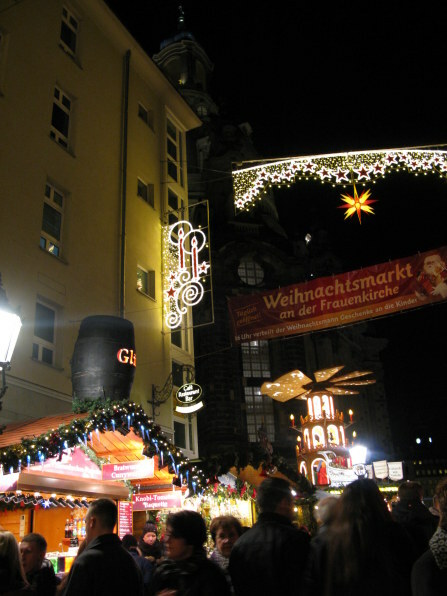 The Christmas Market at the Frauenkirche is always popular and always busy – and as one of the earliest of Dresden Christmas Markets, it builds annually on its reputation of being traditional. 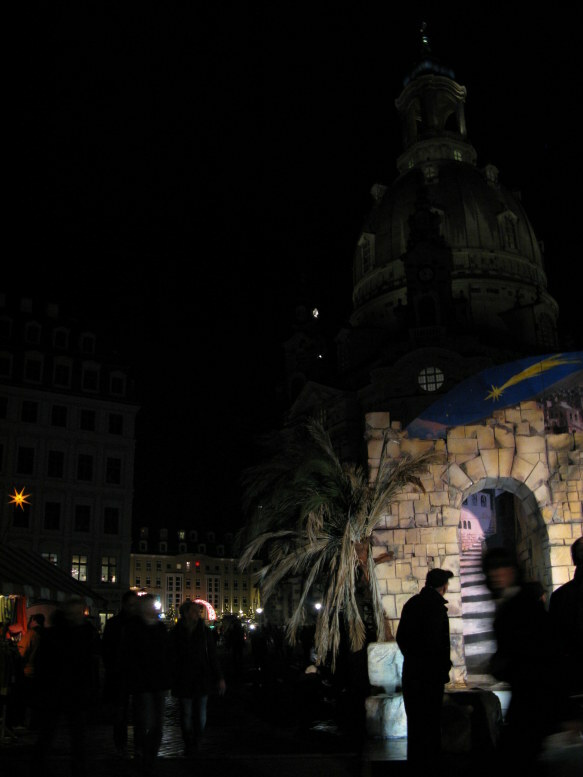 It is here in the shadow of the Frauenkirche, that the Christmas Nativity Scene draws crowds to witness the three Kings bringing their gifts. It is a lovely setting for the crib. 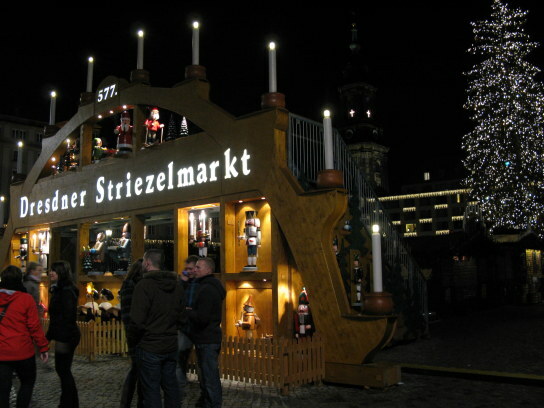 Like all of the Dresden Christmas Markets, this is a market well served with good things to eat and drink. 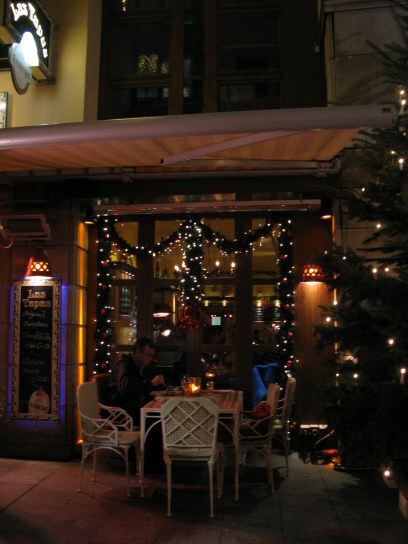 The Münzgasse laneway beside the Frauenkirche is a lovely setting in which to enjoy your Glühwein and Bratwurst. 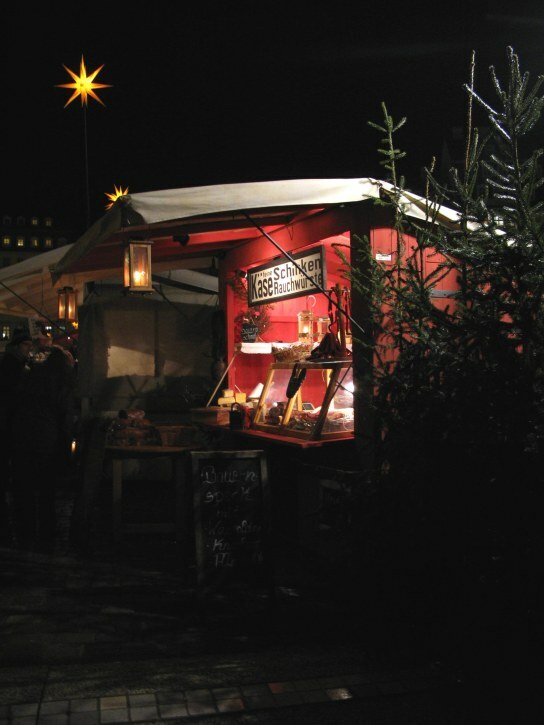 Farmers-own sausages are always really tasty and on a cold night it is always hard to walk past a Bratwurst stand in any city – but in Dresden at Christmas – nearly impossible. 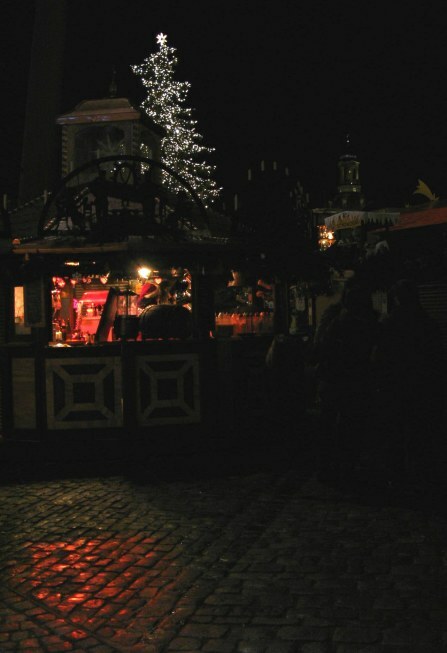 Here there is another Christmas Pyramid above a Glüwein stand. 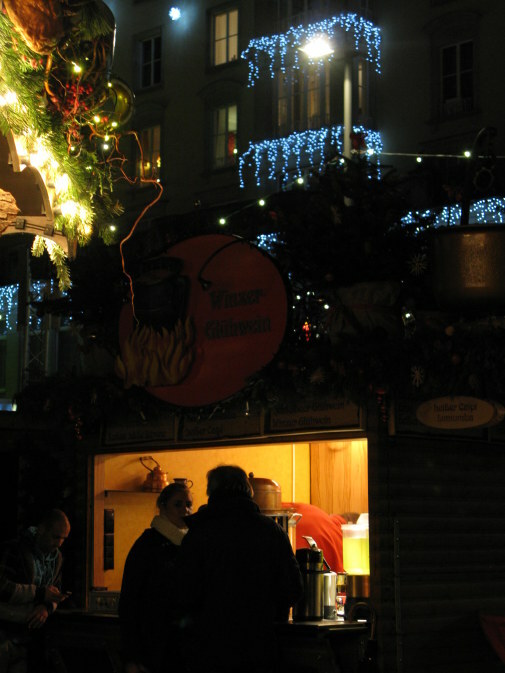 Glühwein is one of those things for which many of us have a recipe, and as with every German Christmas Market, here in Dresden there are many varieties to sample. Here is a very old Glühwein recipe with its magic ingredients of pomegranate and saffron. It comes courtesy of the Saxon Castle of Wackerbarth in the Elbe River Valley on the outskirts of Dresden and stems from the early 1800s. Wackerbarth’s General Field Marshall August the Strong was reputedly an alchemist, scholar, world traveller, and vintner of some repute, and this is his legacy to us. This more traditional market is full of beautifully crafted things - here exquisite glass and ceramics. I am always drawn to the stalls that sell the little wooden smoking men with their tiny cones of incense. The traditional smoker man was originally made of dough, but is now firmly entrenched as a wooden person. 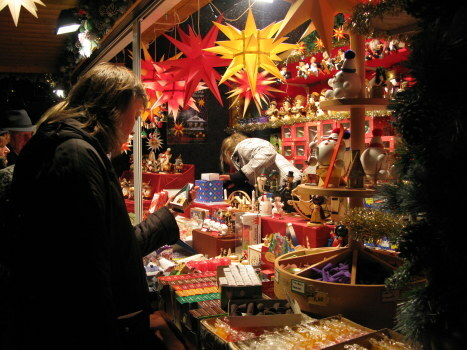 I am always fascinated to see what is on offer as they come according to profession, types of Santa Claus, famous people, representing various hobbies, animals, and the loveliest category of all: those who have fund no home elsewhere and fall under the claim of being Miscellaneous. These ‘Miscellaneous’ wooden Christmas smokers can include anything from angels, to an Arab in dishdashe holding a water gourd, or with a falcon on the arm and hookah pipe at the feet, or even holding an Arabian coffee pot and tray of small coffee cups. There might be an Auntie with stern face and rolled umbrella, a magi, a bass drummer, any number of Bavarian folk, perhaps a mother with freshly cooked cake, a bunny, a black forester complete with cuckoo clock, or a bride. You can see why I cannot pass such a stall by! There is always a wide choice of beautifully crafted woodwork – some by made by hand and other made in quantity with lathes, programmable fret saws, and other woodworking tools. 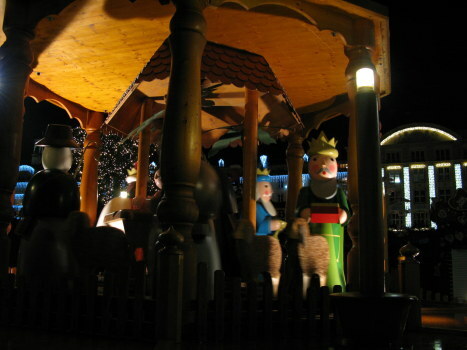 This wooden Christmas smoker stall has a Viking, a monk, a king, and what looked like a moose on skis – but might have been a reindeer, all sharing the same platform. Above them sat elves on mushrooms, another bigger reindeer with sacks of toys and wearing a very fine winter coat and scarf, and a tiny Christmas pyramid made from wood shavings folded over for foliage. 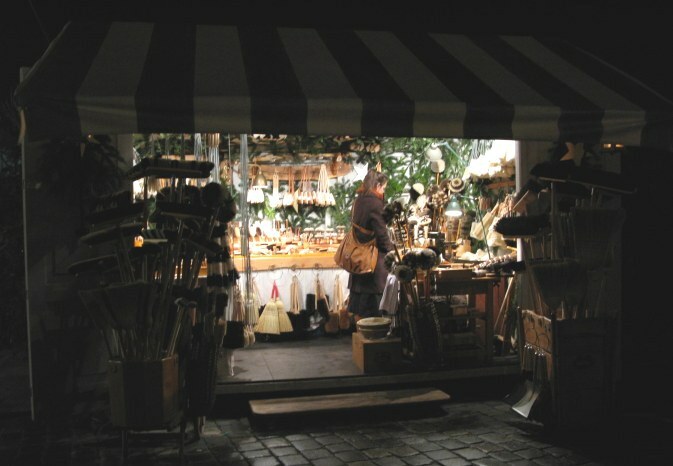 At a German Christmas Market there are always amazing brushes of every size – from those to brush off your mushrooms before cooking, to bottle-brushes, hair brushes, and brooms worthy of the best wicked witch of the west. 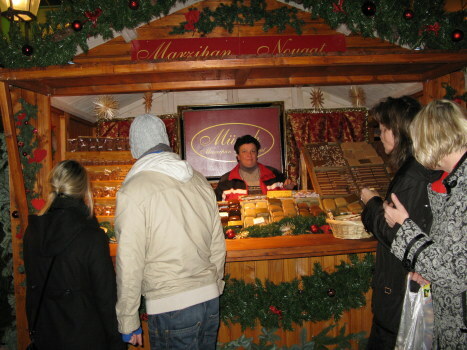 Many people come to the Dresden Christmas Markets to buy their Stollen and Marzipan. It is mouth-wateringly good marzipan and when added to the Stollen – guaranteed to be very “more-ish”. 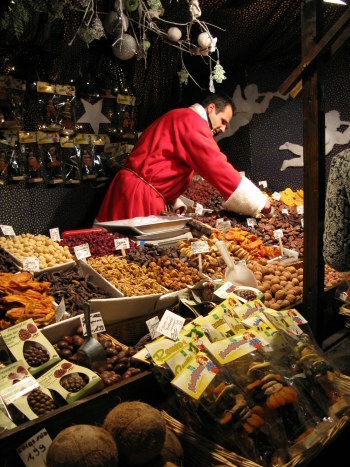 When shopping in a German Christmas Market, whether in Dresden or any other city – there must be a nut stall. 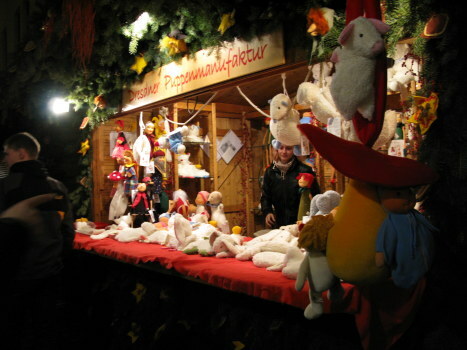 Well you should be prepared for the festival of St. Niklaus, and then again on Christmas Eve there are stockings to fill. On the 6th December St Nick comes to fill the shoes left outside the house door with nuts and oranges and sometimes even small gifts – but only if you have been good – especially if your naughty was really good! 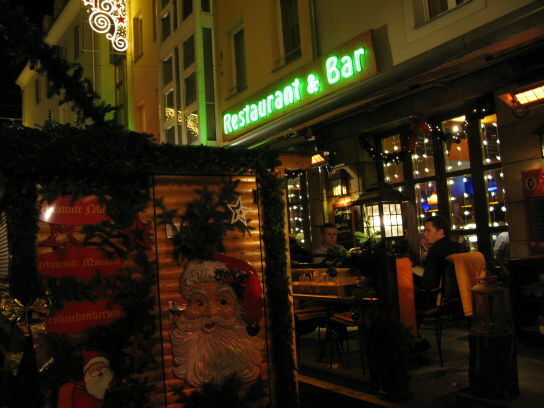 There is no shortage of places to sit down and enjoy some festive cheer and people-watch as you do. This restaurant behind the nut stall was like sitting in a postcard. 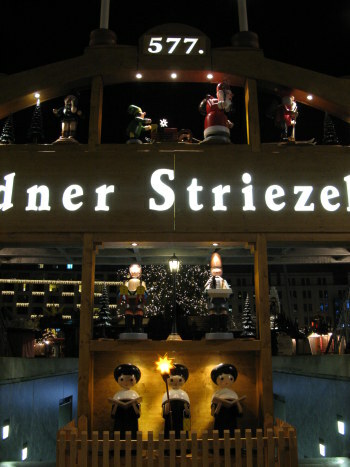 Not far away there was a bit of cultural crossover – with a Dresden tapas bar bedecked for a Dresden Christmas Market. 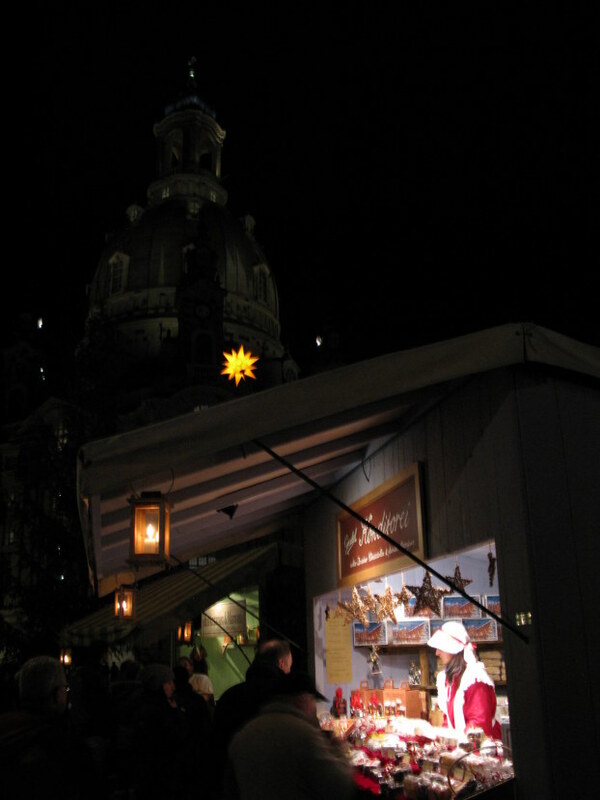 In the traditional Dresden Christmas Market beside the Frauenkirche there are gingerbread houses both built and in kit form with costumed sellers, and for those of us not used to a German Christmas market, in the shadow of the Frauenkirche it seems to be like an image of Christmas imagined. 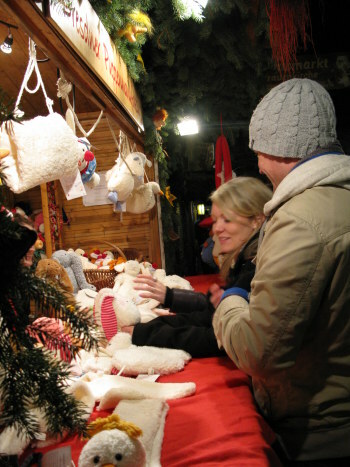 Further along were soft hand puppets, animal character water-bottle covers, and pyjama cases for little people. If adults feel drawn to touch these fanciful creatures then children must be compelled to do so – and this has to make for a very well-accepted Christmas present for a small person. 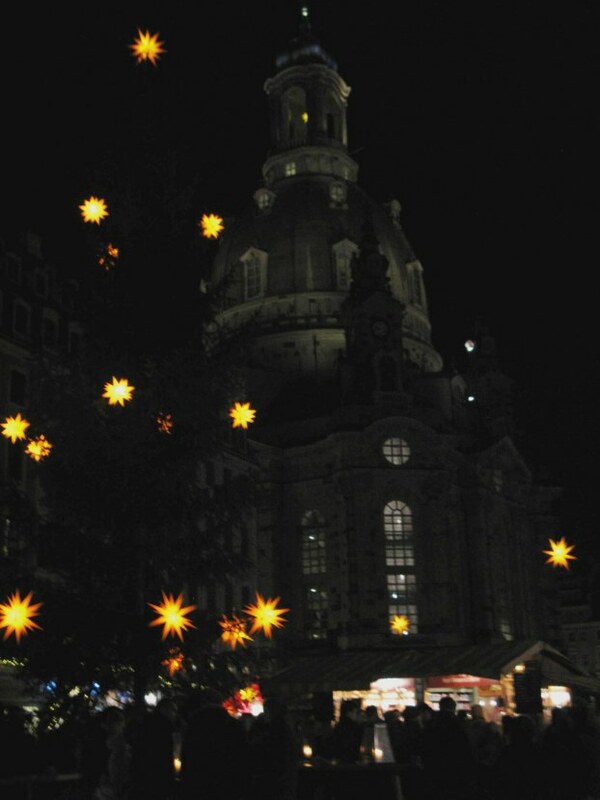 The Christmas market by the Frauenkirche is my favourite and you can see why. 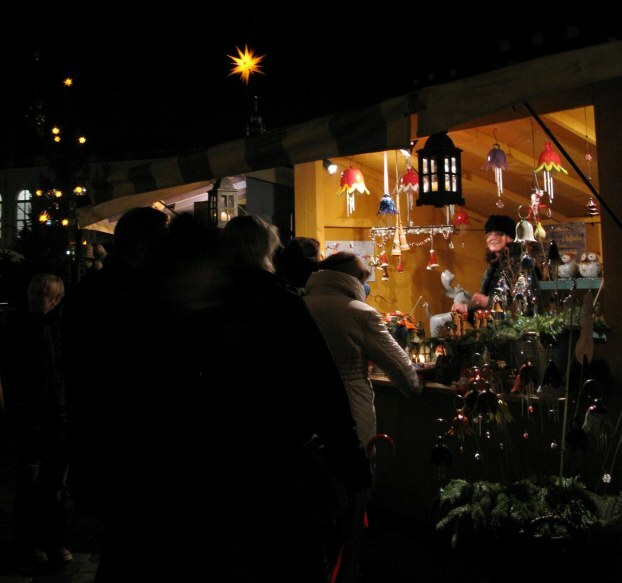 The Münzgasse is always a wonderful place to explore at any time of the year, but the Christmas Market enhances its magic. The lane leads to the River Elbe and you can climb the few steps to the Brühlsche Terrace for wonderful views in all directions. 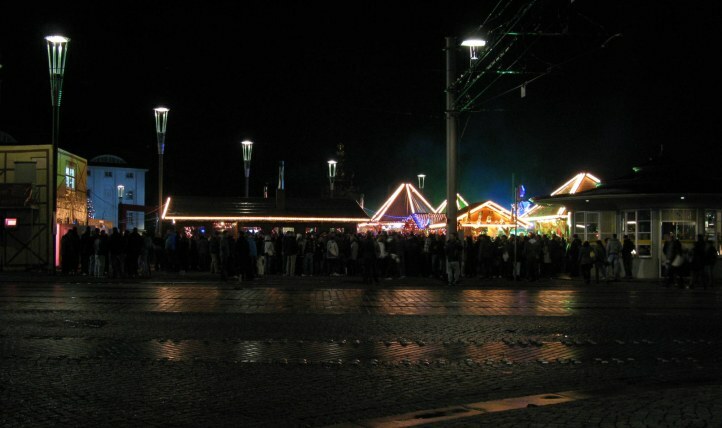 In one direction you look back on the Dresden Christmas Market by the Frauenkirche as in the previous photo. In the other there is the River Elbe – hosting water borne visitors. 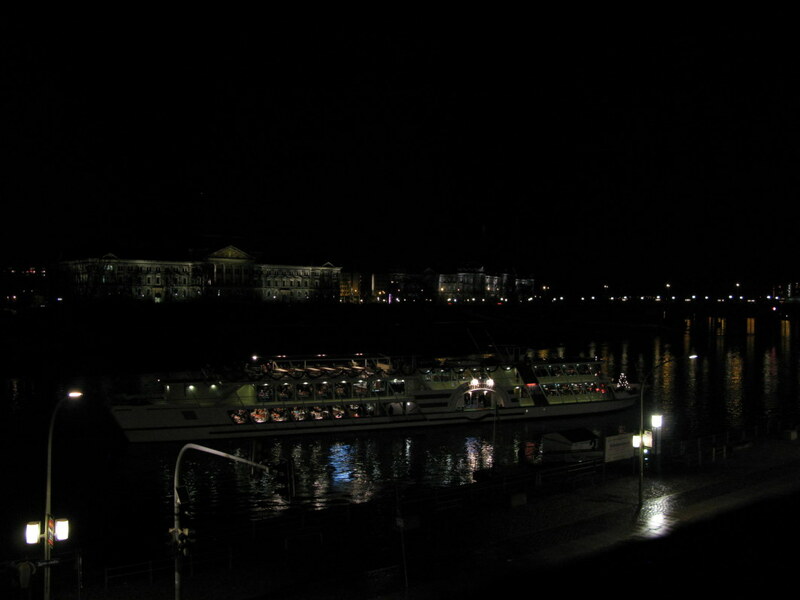 Here on the Brühlsche Terrace it is magical at night. You can lean on one statue and gaze at the scene before you, always seemingly bathed in a golden light. 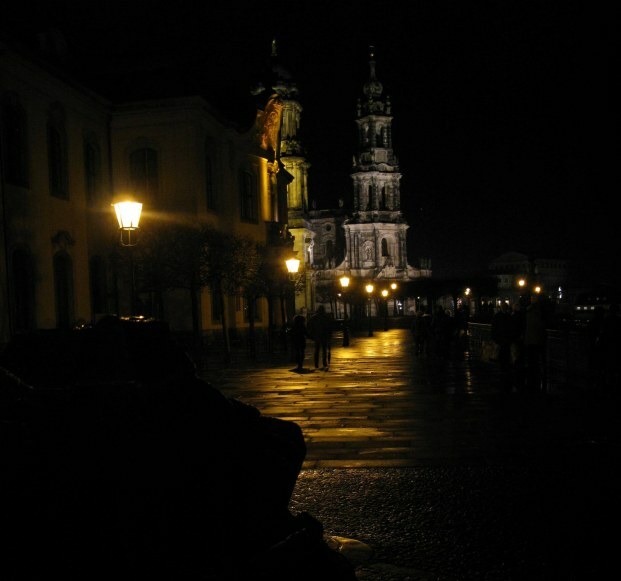 I had remembered it from my two previous trips to Dresden and it never fails to delight me. Just before you climb the stairs above the Münzgasse, if you glance upwards you see the angel with trumpet above the Dresden Academy of Art blessing us all. The Dresden Academy of Arm might be guarded by this musical angel but art is everywhere in Dresden – it is a city of immense soul and quiet beauty. As I was leaving for my lonely 5 hour drive back home to sleep quickly before being at work near Frankfurt the next day, I was pondering this beauty I always find in Dresden and smiling to myself to have been part of it – even so briefly. As I headed back to where I had parked my car, I turned a corner and here was another expression of the unexpected that Dresden specialises in. Why here in a subway? Who created him to delight passers by? 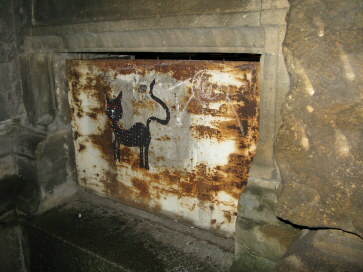 Was he a devilish cat – or just not pleased at being photographed with a flash? The unexpected appearance of this rather fine calico cat is my last whimsical memory of the Dresden Christmas Markets.